Check out this free offer at Kum & Go. 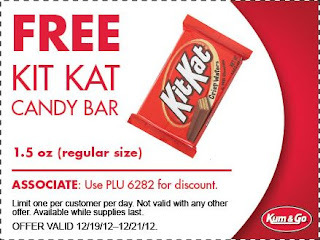 Print out your coupon and take it to redeem for a FREE Kit Kat Candy Bar (1.5 oz Regular Size) at Kum & Go stores. Offer good 12/19/12 through 12/21/12. Click on refuel store Locator to find a store near you.